BROOKS, Jack Bascom, a Representative from Texas; born in Crowley, Acadia Parish, La., December 18, 1922; moved with his family to Beaumont, Tex., in 1927; attended public schools and Lamar Junior College, Beaumont, Tex., 1939-1941; B. J., University of Texas at Austin, 1943; enlisted as a private in the United States Marine Corps November 7, 1942, serving overseas twenty-three and one-half months on Guadalcanal, Guam, Okinawa, and in North China, and discharged as a first lieutenant April 23, 1946; colonel in the United States Marine Corps Reserve, 1946-1972; member of State house of representatives 1946-1950; graduated from the law school of the University of Texas in 1949; was admitted to the bar the same year and commenced the practice of law in Beaumont, Tex. 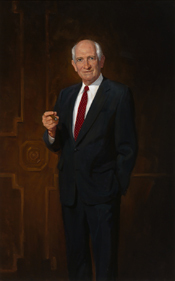 ; owns and operates a farm; elected as a Democrat to the Eighty-third and to the twenty succeeding Congresses (January 3, 1953-January 3, 1995); one of the managers appointed by the House of Representatives in 1988 to conduct the impeachment proceedings against Alcee Lamar Hastings, judge of the United States District Court for the Southern District of Florida; one of the managers appointed by the House of Representatives in 1989 to conduct the impeachment proceedings against Walter L. Nixon, judge of the United States District Court for the District Court of Mississippi; unsuccessful candidate for reelection to the One Hundred Fourth Congress; chairman, Joint Committee on Congressional Operations (Ninety-second and Ninety-fourth Congresses), Committee on Government Operations (Ninety-fourth through One Hundredth Congresses), Committee on the Judiciary (One Hundred First through One Hundred Third Congresses); died on December 4, 2012, in Beaumont, Tex. Oral History: 1971, 46 pages An interview with Jack Bascom Brooks conducted on February 1, 1971. Videocassettes: 1982, 13 commercials on 1 videocassette. The commercials were used during Jack Bascom Brooks's campaign for the 1982 U.S. congressional election in District 9 of Texas, Democratic Party. Papers: ca. 1953-1995, amount unknown. The Jack Brooks Collection includes photographs, legislation, correspondence, research materials, memorabilia, official documents, and campaign materials that span the entire career of Congressman Brooks. The material will be accessible to researchers once processed and housed. Brooks, Jack. "Gramm-Rudman: Can Congress and the President Pass This Buck?" Texas Law Review 64 (August 1985): 131-55. Cohen, Richard. The King of Oversight. Government Executive. V. 20 (Sept. 1988): 16-18. Ralph Nader Congress Project. Citizens Look at Congress: Jack Brooks, Democratic Representative from Texas. Washington, D. C.: Grossman Publishers, 1972.